Mobile devices have some unique affordances: They offer location-sensors (e.g., GPS, RFID, WLAN) and they can deliver multimedia content that is time- and place-relevant. Opportunities for embedded assessment can also be used to assess and fine-tune mlearning design. The idea of learning as context-dependent is at least a decade old but mobile devices add new meaning to the term “situated learning” (Lave & Wenger, 1991). By linking to external content, learners have at-need access to information that can enrich their experiences. For example, WikiMe, is an iPhone application that merges the location-sensing capabilities of the iPhone with Wikipedia. Google Googles is an Android application that allows users to use pictures taken with a mobile phone to search the web. And of course, QR codes represent a low-tech, user-friendly way of connecting to location-based information (0nce you have smartphone and a few tips for getting started). 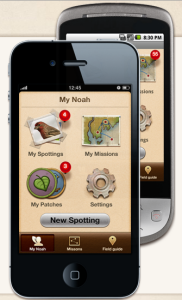 Project Noah which allows learners to accomplish ecological missions and record their observations of local wildlife and plants. Learners can use such platforms to reflect on their experiences, document their observations (encouraging citizen scientists), and connect with others as they explore a location, creating enduring but dynamic materials that others can use. Mobile platforms offer the opportunity to link learners to social networks of friends and peers with similar contexts as they find, explore, and share content. Location-based learning can also be integrated in learning games that involve geocaching or scavenger hunts tied to challenge questions (see, e.g., SCVNGR). In a previous post, I described an interesting application of location-based mobile learning embodied in the Citizens Commons game. Here, New York City players were given the task of finding solutions to community problems. Players took photos and added a description of their ideas. The entry was uploaded to the Commons system with GPS coordinates pulled from the players’ phones. Other players voted on entries and suggested their own ideas for improvement. Although the game could be performed solo, players often teamed up to create their own social experience. 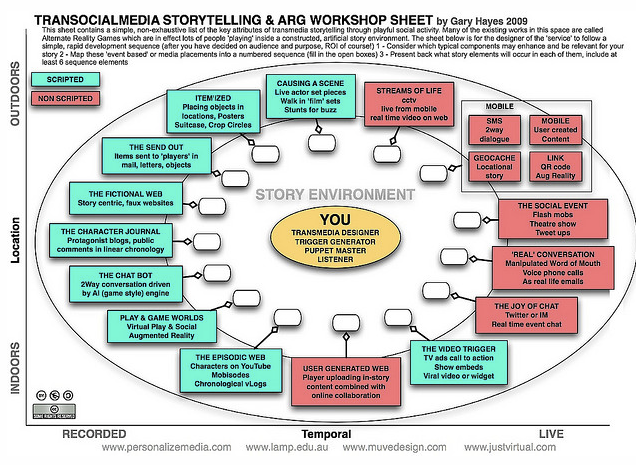 Additionally, mobile devices can be part of larger transmedia games such as Alternate Reality Games (ARG) as this infographic by Gary Hayes illustrates. Mobile devices have also been used as part of emergency response simulations to prepare learners to deal with fictional crisis situations. Newer, more expensive technology, augmented reality (AR) platforms, have also been used to create situated learning experiences as described in Gunnar, 2011, and in this post. On a more low-tech note, mobile devices can also be used to transfer learning from such experiences to real-world practice by providing decision-support systems and performance support tools. Location-sensing devices can be used to combine learning with mobile health applications that sense biometric responses. In one example, researchers at the University of Wisconsin distributed location-aware asthma inhalers to track when and where users had asthma attacks to help patients and physicians better manage the disease and understand asthma triggers. 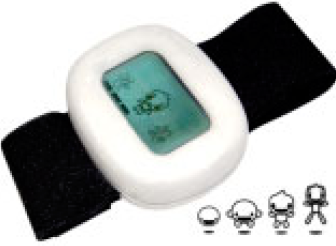 In another approach, Futurelab‘s Fizzees project explored providing children with a digital pet embedded in a wristwatch and responsive to the wearer’s heart rate. When the child was more active, the pet would smile. Although this application does not require sensing the learner’s geographic location, it does involve sensing the learner’s physical “presence” in a location. Additionally, although not requiring the tracking functions of such devices, mobile devices can certainly be used to provide point-of-care patient education and support as described in this article and this post. Mobile devices offer a powerful way to enhance situated learning. As the technology advances, we hope that costs come down, but of course access to mobile devices doesn’t guarantee mobile learning. But these are problems that good design can overcome and it’s a challenge that we, as instructional designers, can embrace.